After Ukraine’s President Viktor Yanukovych fled on Friday evening, his luxury estate is now open to the public and left free to explore for journalists and opposition protesters. An arrest warrant was issued for mass murder after demonstrators were shot by police snipers in Ukraine last week. Presidential security guards were present at the estate after Yanukovych fled, but did not protest against the activists. Volodomyr Pravosodnov, commander of the activists, said the estate was already empty by the time he and his men arrived and security guards were soon persuaded to work with the protesters. Pravosodnov said, “There were no police at the estate, just the regular security guards. 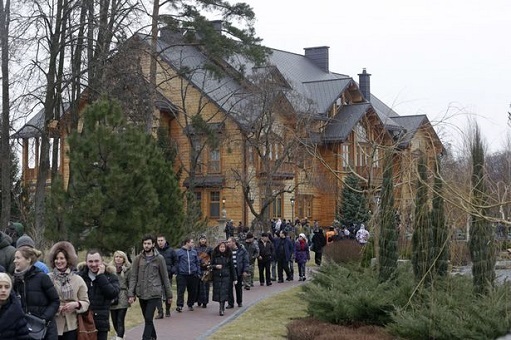 They let us in without any problem and we agreed that we would maintain the perimeter while they look after the building.” On Sunday, activists decided to open Yanukovych’s luxury estate to the public and citizens were allowed to enter for free on Sunday afternoon. What they saw was the evidence of corruption and vanity. Yanukovych’s 343-acre lavish estate features a five-story mansion, a private zoo with sheep, peacocks and ostriches, a greenhouse filled with banana plants, a man-made lake and dozens of luxury cars and other vehicles were found in a garage. Bathrooms with golden water taps, crystal chandeliers and marble floors decorate the Yanukovych’s private mansion and a mansion for his staff, the size of a stately home itself, was found on the other side of the estate. Since Yanukovych became the president of Ukraine in 2010, he has refused to speak about his luxury residence and has always said to live in a modest home inside the estate, also known as Mezhyhirya Park; however, the free tour that thousands of citizens took on Sunday proved otherwise. The country now wonders how he could have afforded his opulent life with a presumed salary of $100,000 per year. Documents, found in the mansion, show that Yanukovych spent $40 million on chandeliers, including a grand chandelier in the main lobby, worth $10 million. Another document shows that a formal request was submitted to Pavlo Levchenko, the family lawyer, to spend $2.3 million on wooden furnishings for the tea and dining room. Now that the country has seen the opulent life Yanukovych has lived, their anger has grown. Activist Mykhailo Gavryliuk was stripped naked and beaten up by Yanukovych’s police force last month and says, “I hope he will be hanged and put away in a place where nobody will ever have to see him again.” Vitali Rus and his wife Lilia are disgusted by the things they have seen on Sunday. “It looks like he was a pharaoh who had the entire empire working for him. Yanukovych clearly spent all tax money on himself, while the country is in crisis,” Vitali said. Visitors of Yanukovych’s luxury estate were urged to not destroy or take anything, even though the property was open to the public. “This is the evidence of thieving arrogance,” an activist said. Yanukovych is now only accompanied by a handful of security guards and his chief aide. One Response to "Viktor Yanukovych Luxury Estate Open to Public"
When do open Buckingham Palace or checkers…………………………………………………………….